The Pittsburgh Steelers were defending NFL Champions and off to a 9-3 start in 1979 but found themselves in a dogfight in the AFC Central with the Houston Oilers, also 9-3, and Cleveland Browns at 8-4. On November 25 they hosted the Browns. 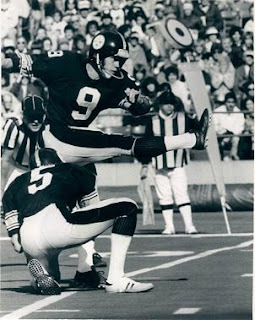 Head Coach Chuck Noll’s team was coming off a humiliating loss at San Diego the previous week but still contained the key players that made the Steelers a champion three times in the previous five seasons, including future Hall of Famers QB Terry Bradshaw (pictured above), RB Franco Harris, DT “Mean Joe” Greene, MLB Jack Lambert, and CB Mel Blount. The Browns, under Head Coach Sam Rutigliano, were a resurgent and exciting team, prone to playing in games that weren’t decided until the last seconds. QB Brian Sipe had emerged as a fine passer and clutch performer and had good receivers to throw to in wide receivers Dave Logan and Reggie Rucker and TE Ozzie Newsome. There were 48,773 fans at Three Rivers Stadium. The Browns went 75 yards in 11 plays on their opening possession despite Sipe being sacked once for a nine-yard loss. Sipe completed 5 of 6 passes, including three that converted third downs and the last a scoring toss of 21 yards to Newsome. DB Larry Anderson fumbled when returning the ensuing kickoff and CB Ron Bolton recovered for the Browns at the three yard line. Cleveland couldn’t penetrate the end zone from there and settled for a 20-yard Don Cockroft field goal to go up by 10-0. Pittsburgh came back with Bradshaw throwing to WR John Stallworth for a 34-yard gain to the Cleveland 35. It set up a 45-yard field goal by Matt Bahr and the score was 10-3. HB Dino Hall returned the next kickoff 33 yards to give the Browns good starting field position at their 44. In a series that continued into the second quarter, Cleveland went 56 yards in 13 plays, helped along by a defensive holding penalty that converted a punting situation into a first down. Sipe completed a pass to Newsome for 20 yards and Cockroft kicked another field goal, this time from 32 yards, to make it 13-3. Pittsburgh moved into scoring territory on its next possession but Bahr was wide on a 39-yard field goal attempt. 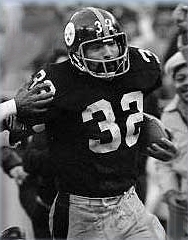 Getting the ball back, RB Rocky Bleier gained 31 yards on four carries and Franco Harris (pictured below) had another for 11 yards. After TE Bennie Cunningham just missed scoring on a pass into the end zone – he was stripped before gaining possession – Bahr was successful on a 34-yard field goal try. Another good kickoff return of 28 yards by Hall once again gave Cleveland good field position and the Browns made the most of it as Sipe threw to Newsome for seven yards and then to HB Calvin Hill for 30. On a third-and-seven play, Sipe threw to Dave Logan for a 16-yard touchdown and 20-6 lead. The Steelers, down by 14 points, came back on a drive highlighted by a sensational catch by Cunningham for a 10-yard gain, another Bradshaw throw to WR Lynn Swann for 17 yards, back to Cunningham for 20, and throws to Bleier and Harris that picked up a total of 15 yards. The 76-yard series ended with a short scoring throw to Harris. It was 20-13 at halftime. The Browns put together a scoring series in the third quarter. Sipe threw to Logan for gains of 20 and 18 yards and to Reggie Rucker for 18. On a third-and-18 play at the Pittsburgh 33, Sipe connected with Logan for 23 yards to the 10. The possession ended with Sipe’s three-yard scoring pass to Hill. Pittsburgh again fought back with an 89-yard drive in 10 plays. A third down was converted with a Bradshaw pass to TE Randy Grossman for 47 yards. Harris scored for the Steelers from a yard out on the first play of the fourth quarter. Pittsburgh’s defense forced the Browns to punt on the next series and it seemed as though the momentum was with the Steelers. However, the Browns got breaks when they recovered a fumble by Harris, who was stripped by SS Clarence Scott after picking up eight yards, and then Jack Lambert kept Cleveland’s ensuing drive alive by roughing Sipe on a third down play. It resulted in a field goal of 40 yards by Cockroft that put the Browns ahead by ten points. Down by 30-20, the Steelers fought back and had a first down on the one yard line when Bradshaw was sacked. But they came back to score a touchdown on a three-yard run by Harris that, with Bahr’s extra point, made it a three-point contest. On their ensuing possession, the Browns got a first down at midfield thanks to a face mask penalty on LB Robin Cole. However, DE L.C. Greenwood, who had an unofficial 4.5 sacks on the day (individual sacks were not officially compiled until 1982), combined with DT Steve Furness to dump Sipe shortly thereafter to force a punt. WR Theo Bell returned it 27 yards to the 50 to set up Pittsburgh’s drive to the tying points. Bahr kicked a 21-yard field goal to knot the game with 24 seconds left in regulation. In overtime, Mel Blount and Ron Bolton both had interceptions. The game turned on a Cleveland decision to accept an illegal motion penalty on the Steelers in a second-and-ten situation. Rather than facing third-and-nine, it was second-and-fifteen, giving Pittsburgh an extra down. It proved significant when, on third down, Bradshaw took off on a 28-yard scramble to the Cleveland 38. Five plays later, Bahr booted the game-winning field goal from 37 yards with just nine seconds remaining in the extra period. Pittsburgh won by a final score of 33-30. The Steelers led in total yards (606 to 345) and first downs (36 to 22) – indeed, Pittsburgh’s yardage total was the second-highest in club history at the time and the 36 first downs were a new franchise record. The edge was particularly notable in the ground game as Pittsburgh accumulated 255 rushing yards to Cleveland’s 62. But the Steelers also hurt themselves by turning the ball over three times (to one by the Browns) and committing 10 penalties at a cost of 95 yards (as opposed to Cleveland’s 8 for 65 yards). However, they also sacked Brian Sipe seven times, including three in the fourth quarter alone. Terry Bradshaw completed 30 of 44 passes for 364 yards and a touchdown with one intercepted – he also ran the ball three times for 43 yards. Franco Harris rushed for 151 yards on 32 carries with two TDs and caught a career-high 9 passes for 81 yards and another score. Rocky Bleier contributed 10 carries for 61 yards and pulled in 7 passes for 45 more yards. WR John Stallworth caught 6 passes for 75 yards. Rookie Matt Bahr kicked four field goals in five attempts. 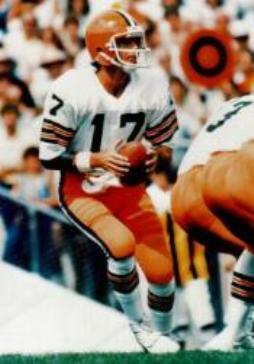 For the Browns, Brian Sipe (pictured below) was successful on 23 of 38 throws for 333 yards with three touchdowns and an interception and was also the team’s leading rusher with 30 yards on three carries. Dave Logan topped the receivers with 7 catches for 135 yards and a TD. The win put the Steelers in a first place tie atop the division with Houston while Cleveland fell two games back. Ultimately, Pittsburgh went on to win the AFC Central with a 12-4 record and defeat the Rams in the Super Bowl – the fourth such win since 1974. The Browns defeated the Oilers the next week but lost their remaining two contests to finish in third at 9-7. 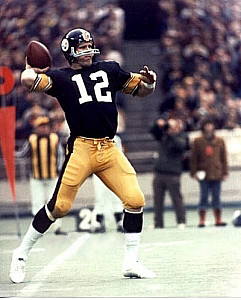 Terry Bradshaw placed second in the league by averaging 7.9 yards per attempt, third with 3724 passing yards and fourth with 26 TD passes, although his 25 interceptions ranked second. He ended up with a fourth championship under his belt and was selected to the Pro Bowl for the third time. Franco Harris rushed for 1186 yards on 267 carries (4.4 avg.) and 11 touchdowns. He was named to the Pro Bowl for the eighth straight year. Brian Sipe placed second in passing yards (3793) and tied for first in TD passes (28, along with New England’s Steve Grogan). However, reflecting his gambling style of play, he also led the NFL with 26 interceptions. In his first NFL season, Matt Bahr (pictured below) was successful on 18 of 30 field goal attempts (60 %) and led the league with 50 extra points in 52 tries. He played one more year with the Steelers but lasted a total of 17 seasons – 8.5 of them with the Browns.